As Boeing’s B787 Dreamliner transitions from development and certification to airline operation, airlines are so far proving the type to be more utilitarian, replacing less-efficient predecessors, than network changing. 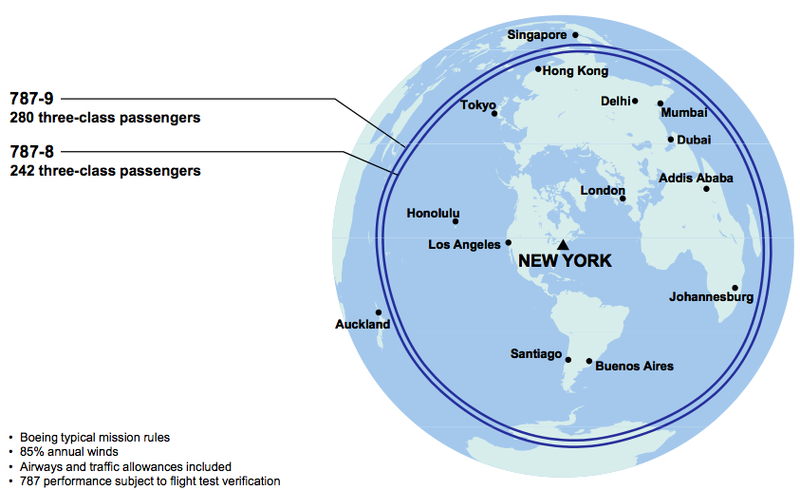 Even if the B787 does not come close to opening the 450 new long and thin routes Boeing estimated early on would be possible, the aircraft will dominate in the Asia-Pacific region, which claims ownership of 43% of announced airline orders. The aircraft’s practicality is also reflected in cabin layouts, which so far have not come close to trumpeting the Airbus A380’s headline-grabbing features, but do not need to since the B787 is less designed for competitive hub-to-hub flying. Regardless of where and how airlines deploy their new B787s, their orders for it - even if delayed - are of exceptional value, with Boeing undercutting its earnings. Japan’s All Nippon Airways (ANA) took contractual delivery of its first B787 on 25-Sep-2011, with additional ceremonies planned for 26-Sep-2011 before the 27-Sep-2011 delivery flight that arrives in Tokyo Haneda on 28-Sep-2011. It is the first of 55 B787s to be delivered to ANA, as well as the first of 291 B787s ordered directly by airlines in Asia-Pacific. Globally airlines have ordered 680 B787-8s and its longer-range and higher-capacity variant B787-9. Lessors, business jet operators, and unidentified airlines have also ordered 141 aircraft. The Asia-Pacific region, with large B787 orders from Air India (for 27), ANA (55), Japan Airlines (35), the Qantas Group (50) and Singapore Airlines (20), comprises 43% of announced direct airline purchases of the B787. This is above the 34% proportion of all new civil aircraft Airbus and Boeing both forecast being delivered to airlines in Asia-Pacific through to 2030. The remaining B787 orders are split between Europe, North America and the Middle East with just over 100 frames each, and then rounded out by Latin America and Africa. Boeing’s marketing material from when the Dreamliner was still called the 7E7 – it was christened the B787 in Jan-2005 with an order for 60 aircraft from six Chinese airlines – boasts the aircraft could open 450 new city-pairs within two decades. Although the B787 in-service programme is young, that claim seems bold. For airlines that operate A330-200s, which has a standard range of 7,200nm, the B787-8’s standard range of 7,650-8,200nm will not open as many new routes as airlines that now operate B767-200ERs or B767-300ERs, which have respective ranges of 6,385nm and 5,990nm. Conversely, some airlines may not require the extra range and instead use B787-8s on routes for which the A330-200 is not as economical on. Much will depend on the B787’s final weight, which Boeing has so far only said is overweight without specifying an exact amount. On the day of contractual handover of the first B787 to ANA, executives from the airline disclosed for the first time that their route selection was based on early B787s being overweight, according to local reports. ANA’s entry into service schedule will see the airline operate a special charter flight to Hong Kong on 26-Oct-2011, returning on 27-Oct-2011. On 28-Oct-2011 and 29-Oct-2011 ANA will operate “excursion” flights departing from and returning to Tokyo Narita. On 1-Nov-2011 ANA will commence its first two regular B787 domestic flights, Tokyo Haneda-Okayama and Tokyo Haneda-Hiroshima. ANA is deploying the B787 on secondary routes as its primary operations to Fukuoka, Osaka and Sapporo typically require large-capacity aircraft. ANA will initially operate its short-haul international B787 aircraft as those will be delivered first and ANA wants to expedite crew familiarisation. “The first several aircraft which we will be receiving will have our short-haul international product. These aircraft are to be installed on our short-haul routes such as Tokyo-Asia routes, however, in order to train our pilots as efficiently as possible, we are temporarily putting the aircraft on a shorter range on domestic routes,” an ANA spokeswoman explains. ANA will commence scheduled international operations with the B787 in Dec-2011 with a Tokyo Haneda-Beijing service. Long-haul routes will commence in Jan-2012 with a thrice-weekly service between Tokyo Haneda and Frankfurt, 5,068nm apart. ANA already serves Frankfurt from Tokyo Narita with a B777-300ER. ANA has said it is evaluating other destinations, including Denver, Moscow, New Delhi and Seattle – which are thin but not long, like the Tokyo Haneda-Frankfurt route. Japan Airlines, which, as with the B777, ordered the B787 after ANA did, plans to launch B787 services from 22-Apr-2012 with a four flights per week service between Tokyo Narita and Boston, 5,823nm apart. It is JAL’s first new North American destination in 13 years and Boston’s first link to Asia, although well within the range of B777-200 aircraft, making this route perhaps thin in demand, but not long in terms of range. JAL president Masaru Onishi said the route would be possible “by making full use of the efficiencies of the revolutionary 787 as well as capitalizing on our closer relationship with American Airlines”. JAL has a joint business agreement with American Airlines, who will codeshare on the service. Additionally, JAL is working with major Boston carrier and American Airlines partner jetBlue for onward connectivity, suggesting partnerships are just as important as the B787’s operating costs. Continental Airlines, now part of United, was the first carrier to announce any B787 route, disclosing in 2010 its first routes would be from Houston to Auckland and Nigeria’s Lagos. The Houston-Auckland link is long and thin at 6,444nm. The Houston-Lagos link is less critical on the B787 with a distance of 5,659nm. While B787 delays pushed back the Auckland service, United pressed ahead and is launching Houston-Lagos later this year with a B777-200. Upon ordering 15 B787-9s, Virgin Atlantic gave a slew of potential destinations for its new aircraft – but first and foremost it said the B787, in an undisclosed Upper Class Suite, premium economy and economy configuration, would operate on “many” of the carrier’s existing routes from the UK – London Heathrow, London Gatwick and Manchester – to Africa, Asia, the Caribbean, the United States and the Middle East. 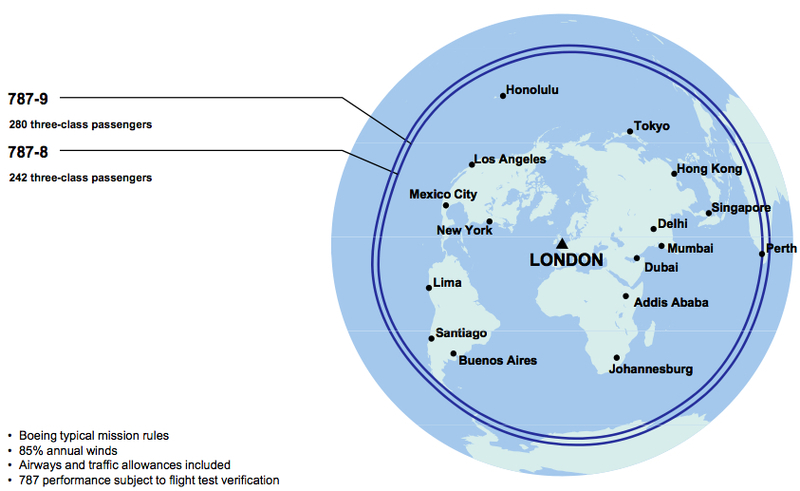 Virgin Atlantic said the B787 would be “instrumental” in establishing new routes “like Bangkok, Melbourne, Rio de Janeiro, Seattle, Toronto and Vancouver” and added that, “Due to the long range of the aircraft, both Perth and Hawaii are currently under consideration.” London is 6,311nm from Honolulu and 7,829nm from Perth, a flight that would be pushing the B787-9’s range of 8,000-8,500nm. With only 15 aircraft on order, and some earmarked to take over existing routes, it is unlikely Virgin Atlantic will realise all of its aspirational routes with the B787 unless it exercises options. Even then Virgin Atlantic may find the B787 does not have enough range, and what equipment it requires is the B777-200LR. Air New Zealand has evaluated the B787-9 against the B777-200LR and concluded the B777-200LR is not suitable, with CFO Rob McDonald coining the latter a “flying gas tank”. Air New Zealand is eager to enter the South American market, and Sao Paulo in particular, but says it does not have optimal aircraft that could operate without payload restrictions or prohibitively high fuel burn rates. “For South America we're certainly looking for a game-changing aircraft that we can exploit,” Mr McDonald said. Adding to that are concerns that in the next one or two years Star Alliance member and dominant Brazilian carrier TAM is expected to merge with LAN and for the two to affiliate with oneworld. With oneworld’s Qantas renewing its push into South America by switching its flight from Buenos Aires to LAN’s hub at Santiago, Air New Zealand may find itself entering a market dominated by oneworld. While Air New Zealand continues to evaluate the potential of a South American link, in part for its home country to become a hub for Asia-South America flights, Mr McDonald said the carrier’s first B787-9s were likely to be deployed to China or Japan. Later Jetstar made known it was evaluating using its B787s to serve European destinations including Athens and Rome. More recently, however, Jetstar has favoured intra-Asia growth and is now instead looking at using B787s to replace its existing A330s on flights within Asia and from Asia to Australia and New Zealand and open new routes in those markets before considering Europe, which is not in Jetstar’s immediate plans. Much has been said about the promised passenger experience on the B787, but perspective is needed. The largest benefits passengers can realise are determined by airlines and their willingness to invest and increase costs. These factors include the seat and how much legroom to give, bars and lounge areas, in-flight entertainment, meal and beverage service and then the soft service from crew. Airframers can put in large overhead bins and LED lighting, as Boeing has done for recent new aircraft types, but these developments are small in passenger impact. The B787 promises bigger impacts, including a higher cabin pressure for a smoother ride and dimmable window shades, but how noticeable and important these features are remain to be seen. This of course is nothing new. The A380 entered service in Oct-2007 with Singapore Airlines on headlines of giant beds in first class, and the next year Emirates had the headlines going again with an on-board bar and showers. Passengers gave acclamations to the A380, but what they most likely appreciated was the airline-determined fit-out that had the latest products. Passenger appreciation for the aircraft will likely be less in a high-density configuration, such as Air Austral’s A380 seating approximately 840 passengers. Likewise, a passenger’s experience with the B787 will be very different whether flying a Singapore Airlines B787 or a Jetstar B787. So far only three airlines have released their seating plans. Launch customer and operator ANA plans to operate three configurations: domestic, short-haul international and long-haul international. Its long-haul international B787 will be the least dense configuration of all announced, seating only 158 passengers across two cabins. The exceptionally low-density configuration can be attributed to 46 business seats configured in very spacious alternating rows of 1-2-1 and 1-1-1 instead of five- or six-abreast, and the 112 seats in economy being configured in a standard eight-abreast 2-4-2 configuration instead of nine-abreast. ANA’s domestic configuration is so far the most dense, seating 12 in its premium class and 252 in economy. Not far behind is LOT, whose B787 will seat 252 passengers across three cabins: 18 in 2-2-2 business class seats that fold down to lie-flat beds, 21 armchair premium economy seats in a 2-3-2 configuration, and 213 economy seats in a 3-3-3 configuration. While Boeing’s standard configuration for the B787 was eight-abreast economy seating in a 2-4-2 configuration, most airlines are expected to select a 3-3-3 nine-abreast configuration. The B787 can more comfortably accommodate a ninth seat in a row than the B777 can accommodate a tenth. Airlines may later have less dense configurations as they seek to reduce weight to the push the range of the B787, and -9 variant in particular. Some operators have at various times suggested they can have a pricing premium on A380 flights, but there is no thorough data to confirm that a pricing premium, if in existence, is because of the aircraft flying or because of its product or if it is flying at a convenient and popular time. As B787s with numerous operators enter service, such claims of pricing premium should be evaluated carefully. The outlook on the B787’s potential in expanding long and thin city-pairs is at the crux of the diverging market views of Airbus and Boeing. Boeing expects Asia-Pacific to account for 40% of the 7,330 new twin-aisles to be delivered through 2030. Driving this is increased liberalization – such as the ASEAN open skies target of 2015 – and Asia’s large geography. Intra-Asia-Pacific routes do not qualify as long and thin while the number of potentially new long and thin routes emerging from liberalization is unknown, but forecasts from Airbus and Boeing suggest traffic will be weighted within the region. The more likely outcome for airlines operating the B787 is that of the B777. While the most recent variant of the B777 family, the long-range -200LR, has the capability to fly upwards of 18 hours non-stop and regularly operates on 14 hour missions (including Qatar’s Doha-Melbourne and Delta’s Los Angeles-Sydney), Boeing says the average sector length for the variant is only nine hours. The entire B777 family, which includes the -300ER variant Emirates routinely pushes to the edge of its operating envelope, has an average sector length of just six hours. The B777 family may fly some long-range routes, but overall few airlines are pushing the aircraft’s range to the edge, and likely few will do so for the B787. Indeed, few new wide-body aircraft have recently enabled airlines to open up great swathes of city-pairs. The A340-500s operated by Emirates, Singapore Airlines and Thai Airways did open a handful of routes, as did the MD-11 and then the B777 that gained more favour over the MD-11 with airlines, Singapore Airlines especially so. The A380, as expected, has barely opened new routes, instead replacing larger aircraft. The driving factor behind new city-pairs being opened by wide-body aircraft has been the results of the Middle East network carriers operating an aircraft to its maximum as they seek to connect any two points in the world through the hubs, with a route from their hub dependent on incoming traffic from the opposite direction. It is narrow-body aircraft that Airbus argues is connecting people with the point-to-point achievement the B787 strives for; 87% of all routes today are served by narrow-body aircraft, whose demand through 2030 is forecast to be triple that of wide-body aircraft. Airbus is more specific about this trend’s implications for airlines. In 2010, by its calculation, 51% of long-haul traffic was between so-called “megacities”, which see over 10,000 long-haul passengers daily, of which there are 39 today with a projected 87 by 2030. Forty-two per cent of long-haul traffic in 2010 was from a megacity to a secondary megacity (under 10,000 long-haul passengers daily), and 7% between two secondary megacities. By 2030 the share will reverse with megacity to secondary megacity increased to 46% of long-haul traffic and megacity to megacity traffic dropping to 45%. Meanwhile, Airbus expects megacity to secondary megacity flights to require “large twin aisle types like the A350-1000” – another plausible but also convenient outlook. The A350-1000 permits Airbus for the first time to target Boeing’s extremely successful B777-300ER, and of which Boeing has no direct response to in its B777 or B787 product ranges, although it is examining an upgrade to the B777 and a new B787-10 variant. As traffic has grown and airlines have upgraded B777-200s to -300s (American Airlines is the latest convert), and B747s to A380s (as most A380 customers are doing), the B787 may be too thin a replacement or expansion aircraft. There could be attraction in flying the B787 – bigger than a B767 but smaller than a B777-200 – on long and thin routes, but there could be even more attraction if the B787 could carry more passengers and cargo at a similar unit cost, as Airbus plans for its A350 XWB family. Airlines might find operating an aircraft larger than the B787 yields a smaller margin per cent but a larger bottom line profit. That dilemma could be addressed through new variants like the B787-10. But there is no doubt the B787 was one of the best deals in aircraft purchasing history. Until the A320neo usurped the B787 earlier this year, the B787 was the fastest-selling commercial aircraft, accumulating 821 net orders in the seven years between first order and delivery. By comparison, the B777 in the five years between first order and delivery accumulated 144 orders. It has since received net orders for 1269 frames. This can be attributed to a shift in airline ordering practice, with airlines now preferring to order aircraft in bulk rather than place incremental orders. For the B787, this has been driven by the desire to secure early delivery slots of an aircraft with 20% reduced operating costs compared to the B767, as well as Boeing offering airlines pricing that was favorable – possibly too favorable. Wrongly assumed design and manufacturing practices led Boeing to undercut itself on the B787’s price for the first 300 frames, FlightBlogger reported last year. Boeing’s list price of the B787-8, which currently accounts for 67% of the B787’s backlog, rose from an initial USD125 million to today’s USD185.2 million, double the percent increase of other models. While some airlines gained favorably from that pricing, their delivery slots are now being spaced out to permit higher-margin B787 orders into the delivery schedule and boost Boeing’s cash flow. On 23-Sep-2011, two days before the first B787 handover, the lead union representing Boeing employees disclosed an additional price undercut in airlines’ favour but Boeing’s detriment. The union, the International Association of Machinists and Aerospace Workers, released an Oct-2009 presentation from Boeing Commercial Airplanes CEO Jim Albaugh to the company’s board of directors. They were evaluating whether to place the second B787 final assembly line alongside the first line in Everett, Washington or in Charleston, South Carolina. 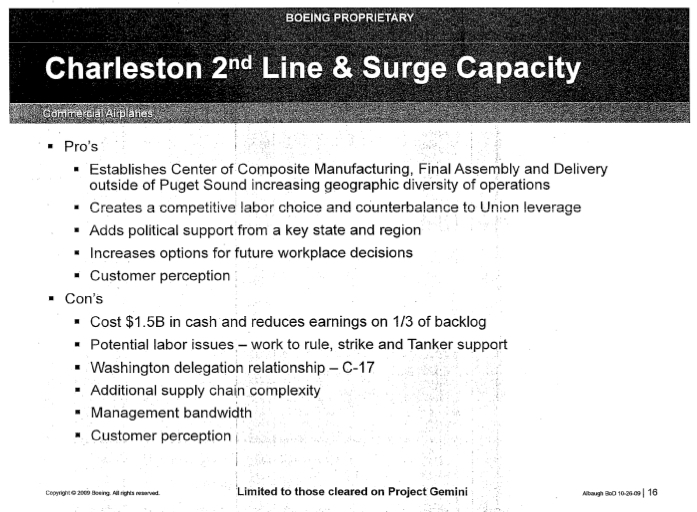 The Charleston line would have a higher cost – USD1.5 billion – and reduce Boeing’s earnings on 1/3 of its B787 backlog, or approximately 270 aircraft of the net 812 frames at the time. Boeing is not expected to turn a profit on the B787 programme until at least its 1000th aircraft. While Boeing’s profitability is another matter, airlines clearly came out ahead financially with their B787 orders. For the first time they gained on widebody aircraft sales the extremely competitive pricing and discounting that had been confined to low-margin narrowbody aircraft. Airlines may rightfully lampoon the seven delays that have pushed back first delivery by 40 months, but few have been affected by competition directly outpacing them with newer aircraft; Airbus’ competing product, the A350 XWB, still lags behind the B787. Airlines have, however, had to put expansion on hold – some of which was to catch-up to competitors – and have seen earnings reduced as they continue to operate less efficient aircraft. Few airlines took mitigating measures, primarily because the seven delays were incremental, with each pushing back entry-into-service, but not by enough to make interim actions cost-effective. For many, this week’s B787 ceremonies close the book on the aircraft’s development. But Boeing still has plenty of targets to meet for its airline customers. Weight reductions must be made in the B787-8 and the B787-9 awaits construction and certification as Boeing turns its eye and resources to its re-engined B737, the Max, next-generation B777 and even the B787-10. Airlines, especially B787-9 launch customer Air New Zealand, are watching closely as they confront the B787’s next challenge: deployment. Whatever gains one B787 operator can make, its competitor can too. The B787, Boeing's first all new aircraft type in 16 years, will carry a wow factor for being new. But airlines must balance replacing older aircraft and using the B787 to open new routes, perhaps long and thin, but more likely just new at a lower operating cost. Jetstar for one is not getting caught up in the hullabaloo, saying its B787 – initially announced as opening new routes to Europe – will instead replace A330s. At the end of the day, that is what Boeing needs: not public excitement but for airlines to quickly see in action the B787’s cost potential and to then order more. What airline will order more or exercise options is hard to discern, but certainly future variants, like the B787-10, will spur sales, which can be expected to continue to fall heavily in Asia. So far 17 airlines have placed 24 additional orders for a collective 119 aircraft. Only with more orders will Boeing make a profit on the aircraft it gave to many of its airline customers for a dream price.